On these pages, and there are two due to the number of images and to avoid you having to wait too long for them to appear, are all the varied places of worship in the City. If I have left any out, then I do apologise, and maybe someone could let me know so that I can remedy the position. They are not in any order because thay are all equally important and relevant to their respective members. 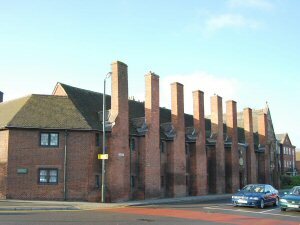 As far as I am aware, there is no Jewish or Islamic place of worship in the City, and the Baptist community share a place of worship with the United Reformed Church in Wade Street which is a united church. 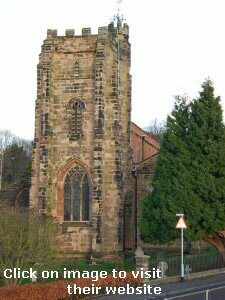 St Chads Church is situated at the far end of Stowe Pool from the Cathedral on the North East of the City where it sits in a slight hollow. 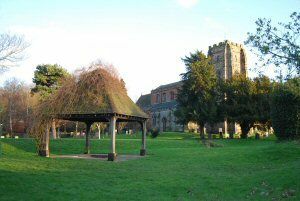 It takes it's name from St Chad who settled in Lichfield as bishop of the Saxon kingdom of Mercia in 669, building his oratory where St Chad's Church now stands. 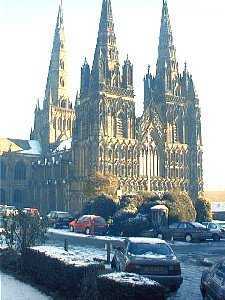 The original church was probably near where the Cathedral now sits. 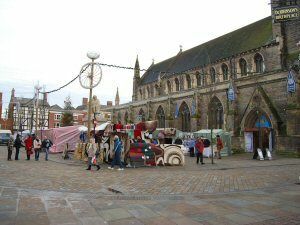 King Offa, who at one time made his seat at nearby Tamworth, secured the influence of the cathedral of St Mary and St Chad spreading as far as Shrewsbury in the west and only later was Coventry seeded it's own cathedral under the influence of Leofric in the eleventh century - better known for his wife, Lady Godiva. At the rear of the church is St Chad's Well, probably not in it's original position, but never-the-less a place of pilgramage for many centuries. St Chad's have a web site - click the picture to visit. St Michaels church, with one of the largest graveyards in the area, sits on the top of the hill at the western end of the town, and it's spire dominates the surrounding area along with the Cathedral spires at the eastern end of the city on the opposite hill. 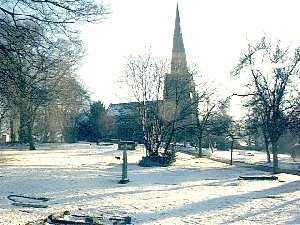 This photograph was taken on New Year's day 2002, about the only time you can see this church owing to the forest of trees that surround it, obscuring it from camera view. There were many children playing among the gravestones, but there was still a sense of peace and rest in this place. Christchurch lies at the south western end of the City surrounded by Yew trees of uncertain age. It can be accessed from Beacon Park; turn your back on the Cathedral and walk across the playing fields to the far side. 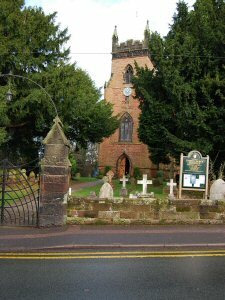 Careful how you cross the A51 - the Council have put a crossing there so make sure you use it, then up the leafy footpath, and the church is on your left. St Mary's Church is in the City Centre in the Market Place and while part of the old church has now been taken over by a Heritage Centre and Cafe, a worship service is still held on a Sunday in a small chapel at the far end as viewed from the image above. From the Heritage Centre, you will find a guide who will take you up the spire to a viewing platform from where you can see all over the City and the countryside around - if you are fit. A market is held outside with stalls two or three times a week, and when you can get to the side walls of the church, have a look and you will see the dates of the last martyrs on a number of plaques on the wall, who were burnt at the stake on this spot - the martyrs, not the plaques. St John's is a small chapel alongside the "Hospital of St John without the Bars of the City of Lichfield" - it says on the notice board outside. This means that this place was outside the old City gates which would have been to the left in the picture, in days when Lichfield was a walled town. St John's Hospital used to be a resting home for elderly gentlemen of poor means and lies south of the City Centre on St John Street - would you believe, and interestingly enough is matched by another building of similar age in Beacon Street on the north side, which was for elderly women and called The Millies. The Millies also has a private chapel but is only accessible by residents and their friends. Both establishments have bedrooms that can only best be described as cells, and originally would have be a small room, not much bigger than a broom cupboard, stone floors and perhaps a straw palliasse to sleep on. I am not so sure about the good old days, I like my duvet and sprung matress. Last updated: November 3rd, 2013.